5 Houston Center building in downtown Houston. HOUSTON – (Realty News Report) – The Ernst & Young accounting firm leased 120,827 SF at 5 Houston Center at 1401 McKinney St. in downtown Houston. The office lease is a relocation and extension within the building, where E&Y has been located for years. Transwestern represented the landlord, Spear Street Capital. CBRE’s Glynn Dyke, Sanford Criner and Jeff Cairns represented E&Y. 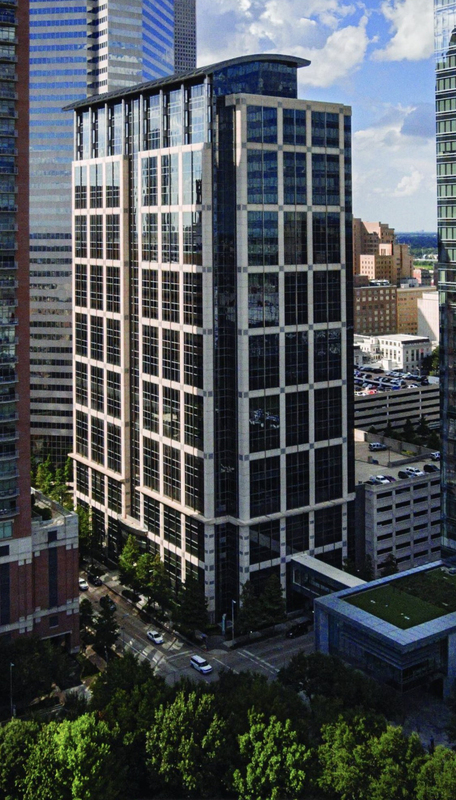 Developed by Crescent Real Estate, 5 Houston Center is a 580,000-SF, Class A office tower that opened in 2001. The building was acquired last year by San Francisco-based Spear Street Capital, which is making significant improvements to the property. “The modernizations, combined with the dynamic surrounding neighborhood, proved to be a great match for EY to be able to continue to recruit and retain top young talent in a highly competitive marketplace,” Transwestern Vice President Tyler Garrett said. 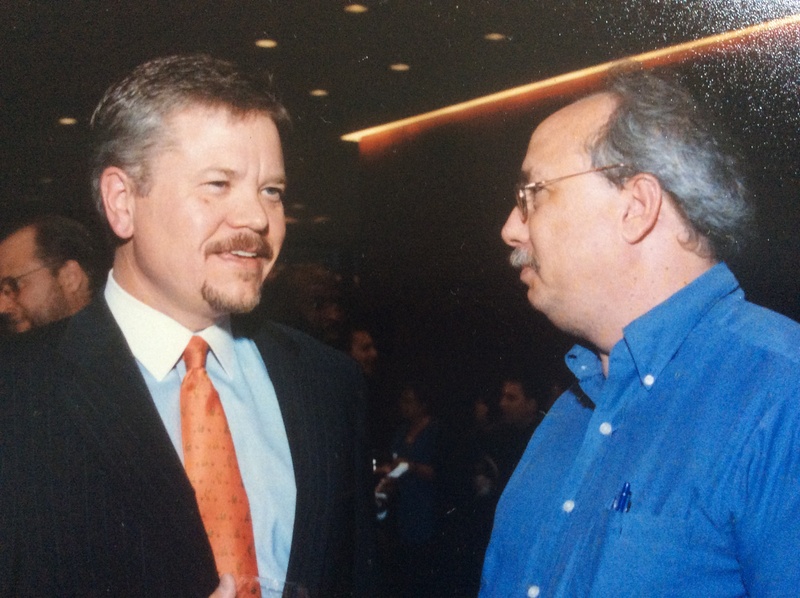 John Goff of Crescent Real Estate and Realty News Report’s Ralph Bivins at the grand opening of 5 Houston Center in 2001. “Reflecting the energy, connectivity and diversity of the Bayou City, the redesign will allow our people to work with more flexibility and teaming throughout the day, providing an enhanced work experience,” said Bill Strait, Houston Office Managing Partner of E&Y. In addition to acquiring 5 Houston Center, Spear Street also purchased two other buildings in a $272 million three-property deal, Energy Center I and 515 Post Oak Blvd. 5 Houston Center is located on the east side of downtown, which has gained momentum in recent years following the completion of the Discovery Green Park and the 1,000-room Marriott Marquis hotel. A number of new multifamily towers, including the 500 Crawford apartments by Marvy Finger, have been developed on the east side of downtown in recent years.